Upgrades, upgrades, upgrades. Everyone is making them and so you ask yourself: Should your business upgrade systems, too? It seems like there’s always a newer version or better software out there. Yet while implementing new and improved systems can help your business scale and save your company money, it’s important to know whether new software is worth the transition. Zendesk recently commissioned Forrester Consulting to conduct a study that evaluated the financial impact of Zendesk on organizations. Forrester interviewed five customers and conducted a financial analysis. 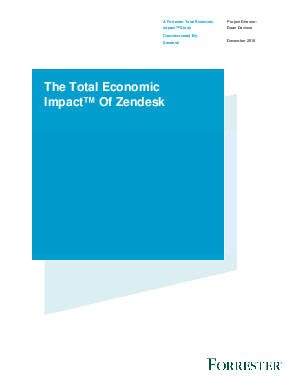 In this study, Forrester lays out the benefits and costs of Zendesk’s family of customer service products, with the analysis pointing to benefits of more than $3.8 million.